You’re damn right I’m upset. I find out I’m a murder victim and a suspect all in the same day. (SPOILERS) There’s an assumption that all originals are superior and so remakes are necessarily inferior. And, to be fair, it’s usually true. There are exceptions to the rule, usually where the original wasn’t really all that much cop to begin with. A case in point is the 1950 D.O.A. 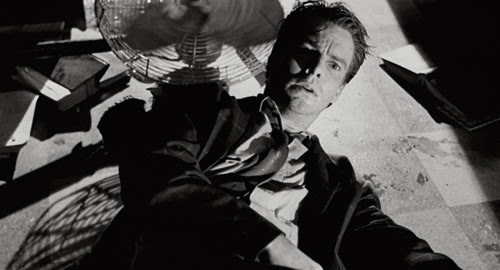 It’s an enjoyable film noir, with a blinding premise, but it was never among the top rank of its genre. No desecration took place when this ‘80s remake came long. It’s he loosest of remakes anyway, lifting the title, opening scene and method of poisoning. I readily admit that I loved this movie when I first saw it, every thunderously scored, excessively directed minute of it. The passage of time shows it off in less complimentary light, but it still has the edge on the Rudolph Maté picture. Rocky Morton and Annabel Jankel, the (then) husband and wife director team responsible for Max Headroom, one of the ‘80s most iconic characters, have since fallen into infamy. More than that, they’ve disappeared off the map (Jankel moved to commmercials and returned to TV). The chief reason for this was the disaster that was the Super Mario Bros. movie. It was a flop enormous enough to be a career-ender, even without all the tales of woe from the production. An indication of how highly I rated D.O.A. at the time; I voluntarily saw Super Mario Bros. at the cinema, fully aware of all the terrible reviews it was getting. Much as I’d slate their the Nintendo movie, I still kind of like what they did here. There’s nothing subtle about D.O.A. ; it’s full of crazy angles (Dutch would be an understatement), affected and self-conscious framing (I particularly like the shot that starts on a water cooler) and hyper-kinetic editing (it’s a wonder Bruckheimer never rang them up). But it works for the material. I don’t for a moment think the duo decided the only way to “do justice” to the excesses of the script was to treat the movie as a whole in kind. If they had that self-awareness, they would never have approved the highly literal, electric guitar solo score from Chaz Jankel (one of Ian Dury’s Blockheads). It hits every cliché on the nose as if this really is the second coming of film noir, but dragged through an MTV studio en route. On the occasions he’s going for the subdued and atmospheric, Chaz’s score is quite effective, but most of the time it verges on aural feedback (and then there’s the occasional montage sequence; best not to dwell on those). 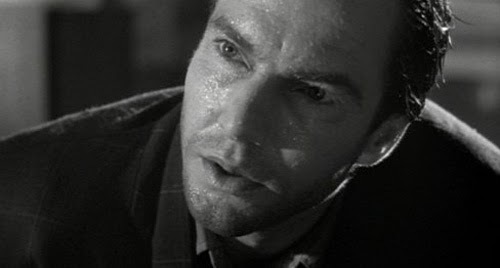 Nevertheless, Morton and Janke’s insanely adrenalised momentum is nearly a perfect marriage with Charles Edward Pogue’s almost wilfully ridiculous script. Who knows, maybe Pogue was taking his cues a bit too earnestly from the original. There, the accountant protagonist notes how unlikely the train of events were as all he did was notarise a bill of sale. 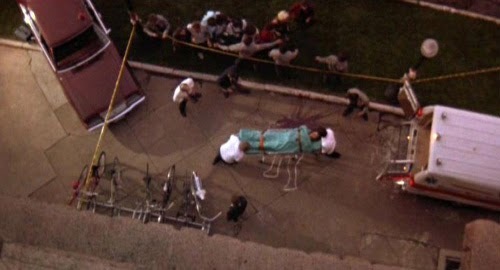 Here, Dennis Quaid’s Professor Dexter Cornell mocks the murderer with “That’s what this is all about? Some kid’s lousy homework?” But the motivation of the murderer is the least of the script’s problems. Pogue takes a “the more red herrings the better” approach, and the aggressive silliness of the plot detours nearly derail the whole movie. Dex: You’re not going to make me drink that, are you? Elaine: No Dex, you already did. Pogue’s theme of “You know, you’re never more alive than when you’re on the edge of death” is lifted straight from the original, but he really could have finessed it a bit. Every time it is (frequently) spouted, it takes the form of pure cheese dripping forth from the dispenser. 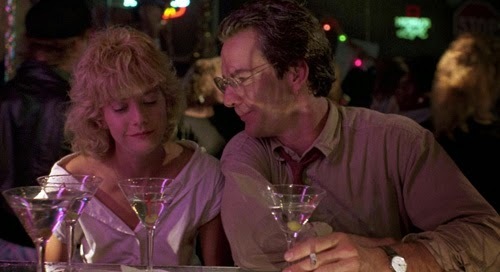 Poor Meg Ryan. She’s in her loveliest phase here as slightly dappy student Sydney Fuller (she dances to Billy Idol in a nowt but a towel, and has made a slip for a party with the letters “Freudian” glued to it). But she is condemned to suffer the worst dialogue indignities. Line such as “I wanted to spend the night with you, not eternity” and “This is life. Right here, right now. Take it” would take down even the greats. Sydney is even a bafflingly good sport about having Dex superglue himself to her. The supporting cast must also soak up dialogue gems and disasters of. Brion James, shockingly, turns up as a detective (a good guy!) 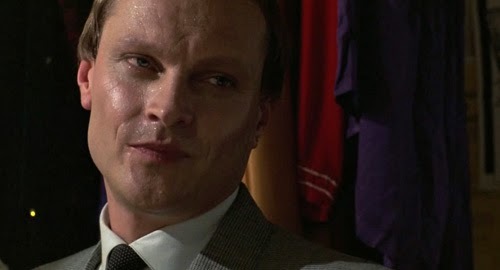 but spouts pure (definitely self-conscious) hard-boiled cliché. His partner Jack Kehoe offers a critique of one of Dex’s novels (“Thematically a little dated, but the prose style holds up”). 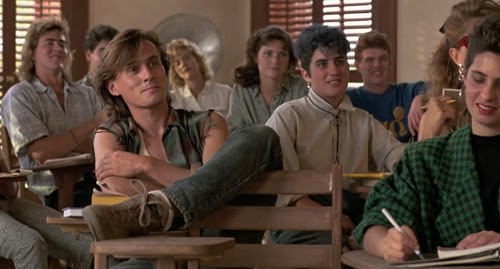 Robert Knepper and John Hawkes were so young (although still a fair bit older than the genuine articles) that they play students. 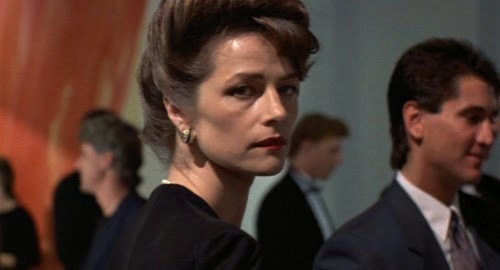 Christopher Neame is served the most giddily daft role, as Charlotte Rampling’s butler/brute Bernard. He delivers a succession of cutting quips, including “Okay, then. Infer this” as he hits Dex for correcting his use of English. Another groan-worthy classic is his response to Dex’s “I’m psychic”; “Then you know what’s going to happen to you”. Daniel Stern keeps on popping up looking ever so slightly uneasy. Which isn’t really all that surprising given his newly discovered and boundless aptitude for murder. 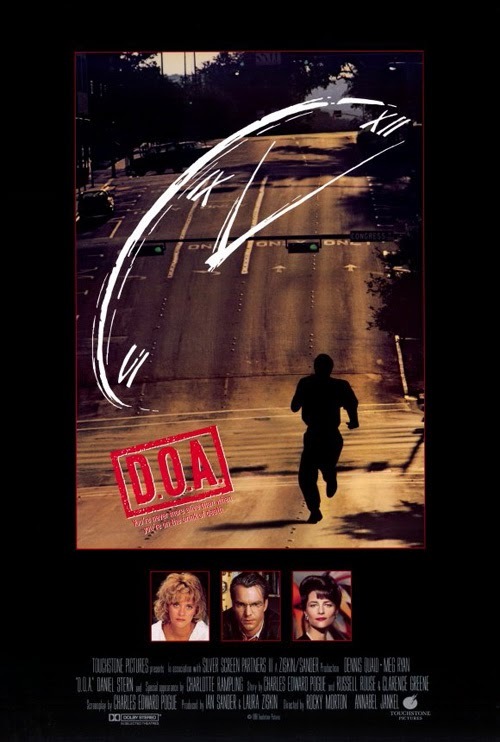 If the whole exercise had been played more tongue-in-cheek, the movie might have become a cult classic. As it is, it’s an overtly stylised time-passer; a remembrance of the days when Dennis and Meg were sympatico, when a college professor could smoke in class (he could?! ), when nail guns had enormous range and when the ‘80s weren’t something to be ashamed of (actually, they always were, I made that last bit up). Morton and Jankel clearly had no shortage of ideas for shots. They just didn’t necessarily need to use them all in one film. From a character seen from the other side of her fish tank (it’s in the wall), to Quaid’s silhouette on a sweltering street (cue montage), to point-of-view blurry hallucinations, to vertiginous zooms up and down buildings, to fans blowing tinsel, this is unapologetically off the leash. 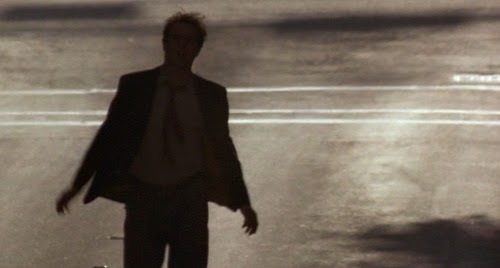 Oh, and there’s also that fade to black and white as Dex approaches the inevitable. Actually, although the slow loss of colour is vaunted as occurring throughout, it’s only evident in the opening scene and the climax. Oh yeah, the tinsel. For some reason D.O.A. is set at Christmas. There’s no rhyme or reason to this (the picture was released in March); it’s in no way integral to the plot. Maybe Pogue did it purely to include an admittedly decent reindeer joke. 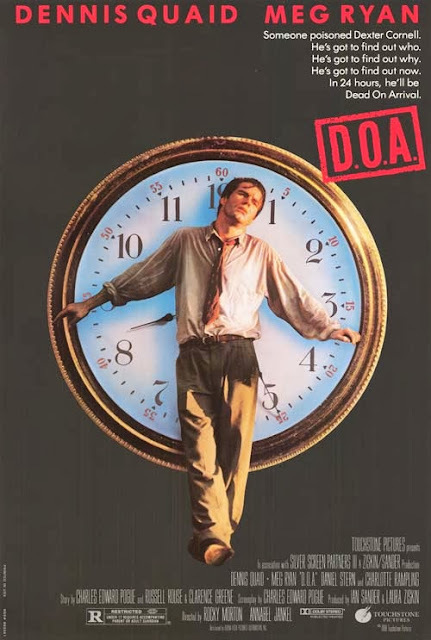 D.O.A didn’t do all that well at the cinema. After five-odd years, realisation appeared to be dawning that Quaid was box office poison. For what reason, I don’t know. I was never aware of this at the time, since I thought most of his movies were pretty good. It’s only 25 years since this remake, which was 38 years after the original. Probably about time for another incarnation. In some respects this one is a more traditional whodunnit than Maté’s, with the necessary suspension of disbelief such plots require. But for all its overkill, D.O.A. 2.0 is actually a fairly respectable remake.